On May 16, 2017, City Council voted to create a Transportation Utility Fund. This fund is dedicated for the operation, improvement, maintenance, and rehabilitation of roads and funded through an $18.50 per month Transportation Fee on each utility account. That fee was scheduled to begin on July 1, 2017. On May 22, a group of citizens filed a petition for referendum which placed the Transportation Utility Fund and Fee on hold, and allowed the citizen group to collect signatures to place the item on the ballot. Ultimately, the petitioners decided against collecting signatures. As such, the Transportation Fund and Fee began August 1. You can see the agenda, listen to the recording, and view the minutes from this meeting at http://bit.ly/HC-archive. This decision was the result of a lengthy process. For more information on that process and what led to this decision, please see the information below. What are the state of the roads? Over the last few years, a consistent compliant from residents has been the condition of the roads. In the 2017 resident survey, 70% of the respondents stated that roads should be the top priority for the City. Out of all 19 service categories, roads received the lowest quality rating with only 19% of respondents thinking they were good or excellent. In fall 2016, the City Council hired PEPG Consulting to inventory all the roads in Highland. Unlike previous studies that were largely based on computer models, this study was based on visual assessment, core samples, and subsurface testing of all roads. This approached allowed the City to evaluate the condition of each road, identity the cost effective maintenance or repair strategy, timeline, and prepare cost estimates. Based on the results of the study, 45% of our roads are in poor or failing condition. In addition, many of our roads are deteriorating quickly from fair to poor making them much more costly to repair. Previously, the City spent about $450,000 on road maintenance. The Road Maintenance Map identifies the maintenance projects completed since 2012. This money comes from funds that are collected as part of the gas tax. The 2016 study showed that $500,000 is the proper amount to spend on road maintenance for only those roads that are not failing. This is within the current City Budget. Additional money was needed for the rehabilitation of poor and failing roads and future maintenance of these improved roads. In order to rehabilitate all these roads, an estimated $7,140,510 is needed or about $1,000,000 per year over the course of 7 years. Of the $7,140,510, $5,623,000 was identified by the study as needing to go toward pavement repair and $1,517,510 identified by staff to go toward curb/gutter, drainage issues, etc. The study estimated that postponing these necessary repairs would increase the cost by 83%. 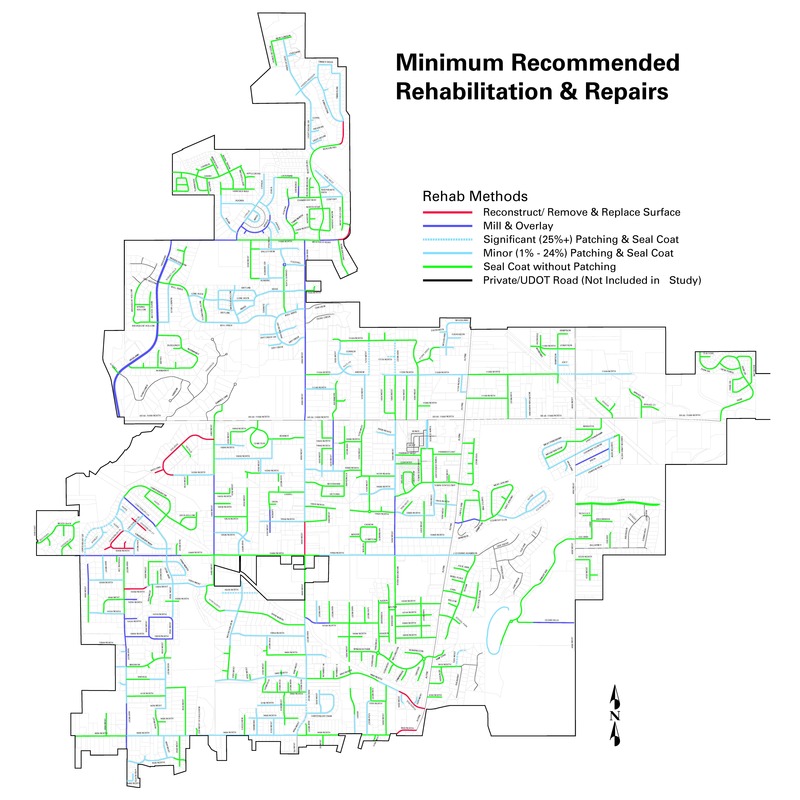 The Maintenance and Rehabilitation Plan and Treatment Map shows the City's plan year by year for the next seven years to maintain and rehabilitate roads. Again, the funds for the maintenance projects are currently within the City budget. Funds for rehabilitation projects were previously not in the City Budget and will now come from the Transportation Fee. After considering all the options, the City Council weighed two possibilities: a property tax increase and a Transportation Fee. For the information related to a property tax increase, click here. The Transportation Fee that was approved is $18.50 per month per utility account. Why did the Council decide on a Transporation Fee? 1) The fee is a flat $18.50 per month per home on utility bill regardless of property value. 2) All properties including tax-exempt ones such as schools and churches will pay a fee. 3) Monies will go to a dedicated road fund that can not be used for other purposes. What was the process for the Transportation Fee decision? After years of research including an updated study in 2016, five Open Houses held in April and May 2017, and many other conversations, City Council voted for the Transportation Fee at the May 16, 2017 City Council meeting. It took effect on the August 2017 utility bill. This was a Council decision. According to Utah State Law, the only way for an item like this to be put on the ballot is through a referendum process. Why couldn’t the City have bonded for the money? 1) Bonding is valuable when you have a single or possibly a few large projects that need to get done relatively quickly such as a constructing a building, purchase of land, development of park grounds, etc. As you can see from the map, Highland has many comparatively small road projects that are spread throughout the city. These roads are at varying stages of deterioration. Some need immediate attention while some can wait a couple years. Their priority for receiving maintenance and/or rehabilitation work is based on the road quality or failure. While the City may have benefited from some volume pricing and inflation money savings, the impact to residents by closing so many roads and the geographical difficulties to manage the work would have been significant. The Council believes that most of those benefits would have been lost due to the need to break the projects down into smaller yearly projects. 2) Bonding would still have required an increase in city revenue whether a property tax increase or fee. There would have been a need for additional revenue to pay the required bond payments. 3) Residents have often asked the City Council to not increase the city debt levels. Right now we pay a little over $1.3 million from the General Fund per year on bond payments. In addition, while we would get a large amount of money up front, bonds like any other loan, would have to have been paid back for the amount borrowed with interest leading to additional costs of $1.5-1.9 million. 4) Road maintenance is an ongoing cost. As stated above, part of the reason our roads are in such poor condition is we haven’t been spending enough money on proper repair and rehabilitation. A revenue increase for just the bonding expense would have not been enough to cover the future costs of maintaining these newly improved roads. An increase in city revenue would still have been needed to cover these increased maintenance costs up and above the current $450,000 budgeted. Couldn’t the City have made cuts to the budget and found the money there? 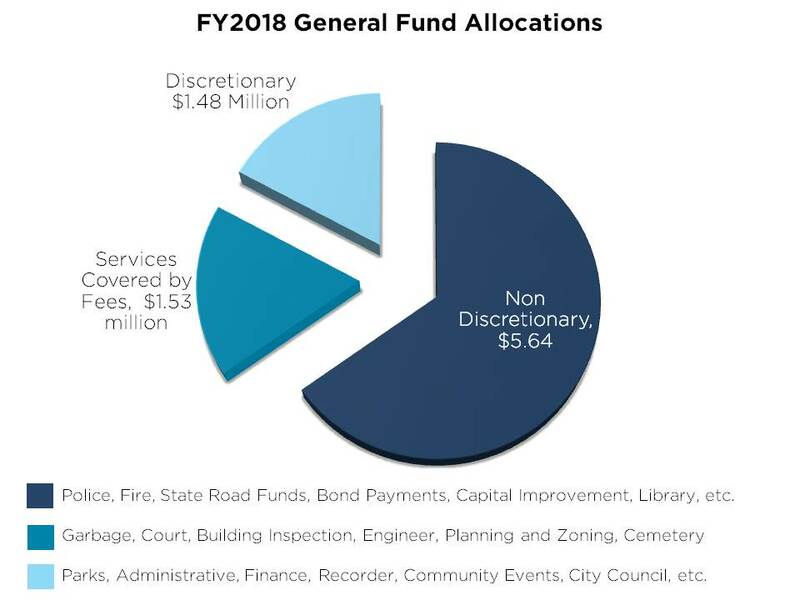 The City’s budgeted General Fund for FY2018 is $8.8 million in revenue with $8.65 million in expenses. Of the $8.65 million, non-discretionary money makes up $5.64 million. This is money that we are contracted, or required by statute to pay such as police and fire services, debt payments, and library operations. That leaves $3.01 million. Of that, $1.53 million makes up departments that are funded by fees for service. For example, court fines pay for the operation of the court and garbage fees pay for the garbage tipping and dumping fees. That leaves $1.48 million of truly discretionary funds. Those funds pay for City departments and expenses which include parks and trails, Administration, Finance, Records, office equipment, city events, etc. Over the last several years, the City Council has reduced expenditures and will continue to find ways to do so. Ultimately, the Council felt that the amount of funds needed to meet the road repair and rehabilitation costs could not be met with these discretionary funds as the need is too big. When the total road rehabilitation needs are $1 million per year, it would have meant cutting each of the previously mentioned departments by 68% to find the needed money. See the chart below for an illustrated version of this. Didn’t the state just raise the gas tax for more money for roads? In 2016 the State Legislature passed an increase in the Class B and C gas tax to go towards roads. 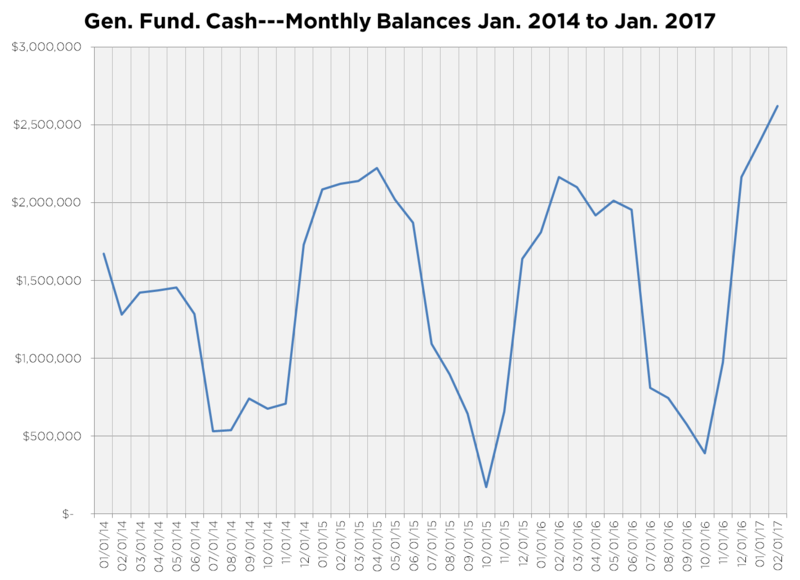 However, because gas prices have stayed lower than expected, that intended increase did not actually happen. In the 2017 session, the Legislature did make efforts to correct this, however the increase is not anticipated to come until 2018. This money is needed for road maintenance and projections show that it will not be enough to fund the vast rehabilitation projects needed. Couldn’t the City have borrowed money from itself? State law does allow municipalities to borrow money for the General Fund from enterprise funds. This was an option, but had the potential for some very negative impacts to the City. Highland City enterprise funds are designed to have the proper amount of cash coverage needed for ongoing expenses and in case of an unexpected system failure or emergency. If those cash coverages were eliminated by borrowing against them, the City would not be prepared in case of an emergency. In addition, it would have created a similar situation to bonding in terms of needing additional revenues from property taxes or fees for repayments, interest costs, and the ongoing nature of road maintenance. Couldn’t bringing in more businesses have solved this problem? Economic development and shopping locally is truly a good thing for our City. However, it does take a substantial amount of sales to generate sales tax revenue for the City. In order to generate the required $1,000,000 in additional revenue needed for roads, Highland City businesses would have needed to generate $200 million in additional sales. This would require more than triple the current number of businesses currently located in Highland. Highland simply doesn’t have the land capacity to achieve this. In addition, when the expansion and/or addition of commercial property presented to the community in the past, it has been met with opposition. Finally, it will take time for those changes to come along with their additional revenues. The Council believes the roads should be addressed sooner than later to prevent increased costs. Couldn't the City have pulled the money from reserves? Reserves are similar to a savings account. Our reserve helps the City in managing cash flows and emergency needs. The Council believes using money from reserves is not a sustainable model because this is not ongoing revenue. Right now Highland City reserves are as low as $500,000 depending on the time of year. The City Council did not feel that it would have been good financial policy, because of the City’s cash needs and the risks involved, to further lower the reserves as this money is needed for unexpected expenditures. See the 2014-2017 balance sheet graph below. Did this really need to be done now? Financially, the City Council felt that it is in the best interest of the residents to properly repair and maintain the roads now. The City could have taken the option of waiting to repair the roads. However, continuing the status quo would have resulted in repair and maintenance costs that are estimated to be 83% higher then they are today if roads fell into the next rehabilitation or repair category. Roads are much cheaper to repair than to rehabilitate. 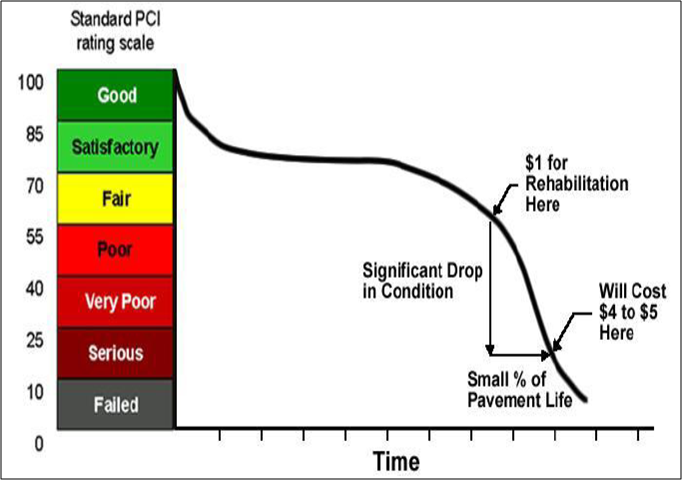 See the attached PCI (pavement condition index) infographic below for an illustration of this. How can we be confident in the 2016 Road study? Unlike previous studies that were largely based on computer models, this study was based on visual assessment, core samples, and subsurface testing of all roads. This approach allowed the City to truly evaluate the condition of each road, identity the appropriate maintenance or repair strategy and timeline, and prepare cost estimates. It goes well beyond what we previously had to use. Please see the past newsletter articles at the bottom of this page, follow us on Facebook and Twitter, or stop by at City Hall. You are also welcome to email or call the Mayor and City Council. What information was discussed as a part of this decision? As a part of the Open Houses, attendees were asked to take a survey on their thoughts on the situation. Below are the results of the survey.